For children to truly learn and engage they need to experience these ‘wow’ moments within the school setting too. It helps them to remember, it reinforces learning and it could also ignite a passion for a particular subject or topic. In June, I, along with two highly enthusiastic and knowledgeable Marine Rangers from Aqualease visited a reception class at a Blackburn primary school. We were there to deliver our Aqua-Explorer British Shore Rock Pool Experience for the morning. As soon as we arrived to set up, wheeling in the rock pool, buckets of animals in hand, all eyes were glued to the front of the room. The children as a class, sat cross legged around the aquarium, while one of the Marine Rangers delivered a short but fun and fact filled talk about the inhabitants, hands were shooting up left, right and centre to ask questions. After the talk, children were quickly split into groups and given group stickers from mussels to starfish, all representing the animals in the rock pool. It was at this point that the ‘wow’ moments really began. As one group at a time, while the others worked through their activity booklets, came up to the rock pool to look at, touch and even hold the animals. It wasn’t just the children saying ‘wow’ but the staff too. Especially when one of the Marine Rangers held up a Queen scallop, that proceeded to spit water to everybody’s amusement. They do this to propel themselves through the water, by sucking the water in through a space between their valves then ejecting it through small holes near the hinge line of the shell. Others were wowed when shark teeth were passed around the groups and even more so when the replica of a Megalodon tooth was available to hold, comparing the difference in shape and size. 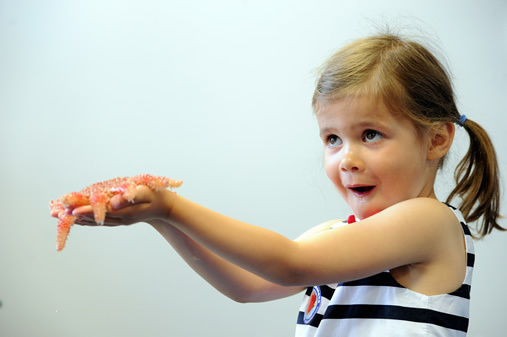 Children wowed themselves, from looking at the crabs through the acrylic of the aquarium to touching then finally holding them. The smiles on their faces said it all! I was also wowed by the information they had absorbed and were able to retell in much detail and with great enthusiasm. One little girl made a fabulous comparison between a mermaid’s purse and a butterfly’s cocoon. How they are both attached to something, a mermaid’s purse to rocks, a cocoon to a leaf, then after a period of time, new life emerges. 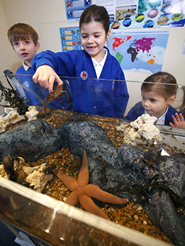 So why not bring a little ‘wow’ learning into your classroom, Aqualease can provide an Aqua-Explorer British Shore Rock Pool Experience for a full or half day booking. Please visit – our Rock Pool Experience page, or contact Aqualease on 0300 3033145 for more details.